A few days ago I stumbled over the job opening at Adidas for a wearable electronic designer but it seems Adidas is making already first low-tech steps towards more interactive fashion enhancements. 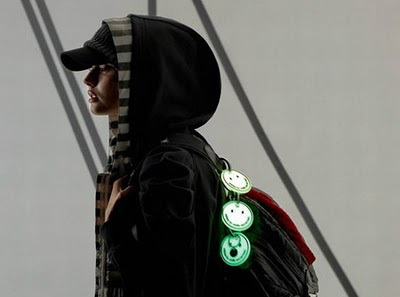 Glow-in-the-dark printing on fabrics is not really a high tech matter but as far as I can judge this, such fashion experiments came only into fashion – so to speak – since wearable technologies in general pushes fashion technology into new territory. Stella McCartney used glow-in-the-dark in an aesthetic pleasant way to design a range for Adidas. The Stella McCartney collection includes Ruched-shoulder jackets, drawstring shorts and lace-up running shoes. Colors and pattern prints are nice and have been in use for many (hundred) years in fashion design as well as beads and other eye-catching elements attached or integrated into fabrics. But all these elements and colors are static, once you choose the print and color it stays there for ever (as long as the season lasts). Adding (re)active materials or technologies make the emotional color and pattern play more interesting, changing it’s appearance triggered by our surrounding environment, when light or temperature or humidity changes the appearance of our clothing will change in reaction of it. 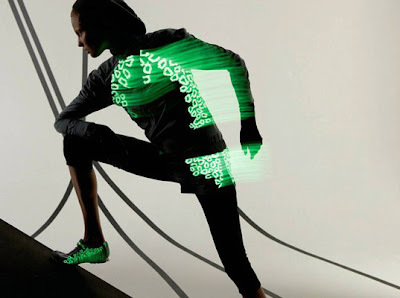 Glow-in-the-dark printing is a first step into a more (re)active future of fashion design.